This is a high quality laminated life-size cardboard cutout of Captain America from Joss Whedon’s THE AVENGERS movie. Manufactured by Advanced Graphics, the cutout is made of heavy-duty corrugated cardboard and comes with attached easel. Display it free-standing or hang it on a wall. Measures 74 x 26 (height x width) inches. Who wouldn’t want Captain America’s shield defending their home from all who enter? A fantastic The Avengers collectible! 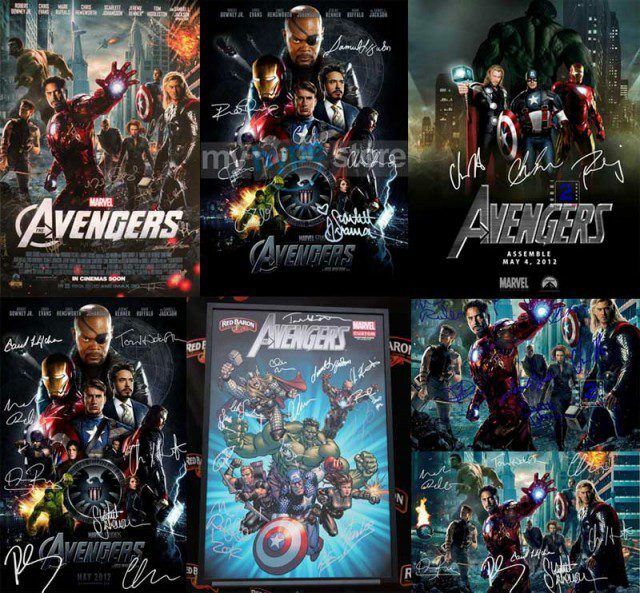 If you want a one-of-a-kind poster of Joss Whedon’s The Avengers then consider grabbing one signed by the cast. Though there are less for sale these days than when The Avengers was first released, I still see a number of sellers offering their signed posters on Ebay daily. Of course, you have to be careful to check that they are legitimate. A good way to do that is to ask for a photo of the signing to accompany the product. But once you’re happy it’s a legitimate cast signed poster, you’ll proudly display it on your wall knowing that it’s a unique Avengers collectible.